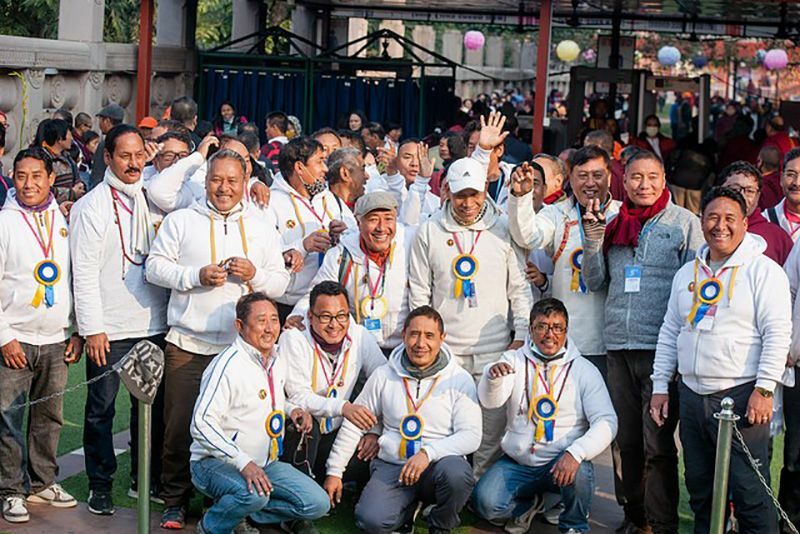 In the pre-dawn of a humid February morning, more than five thousand practitioners, monastic and lay, made their way to the Monlam Pavilion just beyond the gates of Tergar monastery. A participant arriving a bit on the late side would have witnessed neat rows of the sangha, wearing the chögü, the formal outer yellow robe, arrayed toward the front. In the middle and stretching toward the rear was a sea of lay practitioners, mostly from East Asia and Europe, dressed in white to symbolize the purification associated with taking the daily Mahayana sojong vows, a key ritual of the Monlam. Toward the back, the audience was dominated by Tibetans in their finest dress, the women in colorful chubas and pangden (striped aprons), many holding prayer wheels and malas. Promptly at 6:00, the gyalings sounded and the assembly rose as His Eminence Goshir Gyaltsap Rinpoche entered. This year he will preside over the Monlam. Kneeling on a cushion, he took the sojong vows himself before turning to administer the vows to the assembly. Mahayana sojong vows involve giving up eight prohibitions — killing, stealing, lying, sexual misconduct, eating after the noon meal, taking a high seat, wearing jewelry, and singing or dancing — for a 24 hour period, with the aim of benefitting sentient beings. The Buddha Shakyamuni first gave these vows, which are common to all Mahayana Buddhist practitioners. 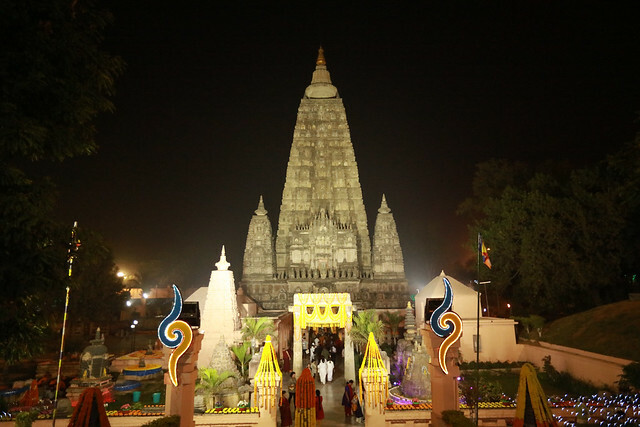 Thus, having engaged in the first of many acts of virtue, thousands of voices swelled as one to chant the ancient Sanskrit prayer of refuge in the Buddha, dharma and sangha. The 35th Kagyu Monlam Chenmo was underway. There were the usual challenges for all in attendance: hard travel, strange food, dust, mosquitos, and the intensifying heat. 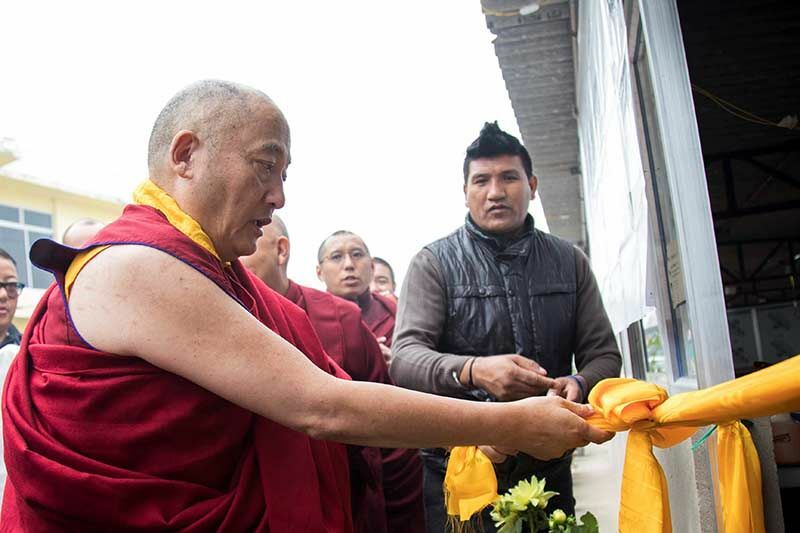 This year, a three-day strike closed all the shops and grounded the taxis and tuk-tuks on the only free day, the holiday between the pre-Monlam teachings and the Monlam proper; and our precious teacher, the Gyalwang Karmapa, could not be in attendance. Nonetheless, the mood was contagiously joyful. Only at the Monlam can one watch an elderly monk from Nepal exchanging prayer wheels with a young Chinese man during a tea break, each captivated by the other’s dharma support; scan down a row and see a Taiwanese mother and child, a middle-aged American, three Tibetans from Sichuan Province, China, and a young Norwegian; or witness people helping the monastic tea servers by passing sustainably produced, pressed wooden bowls down the rows. At the Monlam one can climb the stairs to the publicity office and find translators from ten countries working deftly together, or watch a street dog in a nearby aisle, tormented by mosquitoes, being sprayed with bug repellent by a good-hearted practitioner. At the Monlam one can exchange a warm greeting with the young security team from TCV Suja while going through the back gate for a bathroom break, or quietly rejoice as a long line of sangha members from many lineages and traditions queues for a delicious, free lunch. Most important of all, at the Monlam one can join a vast chorus of fellow practitioners in aspiring for peace, goodness, and the welfare of all sentient beings to prevail in the world. It is well worth the hardships and discomfort involved. 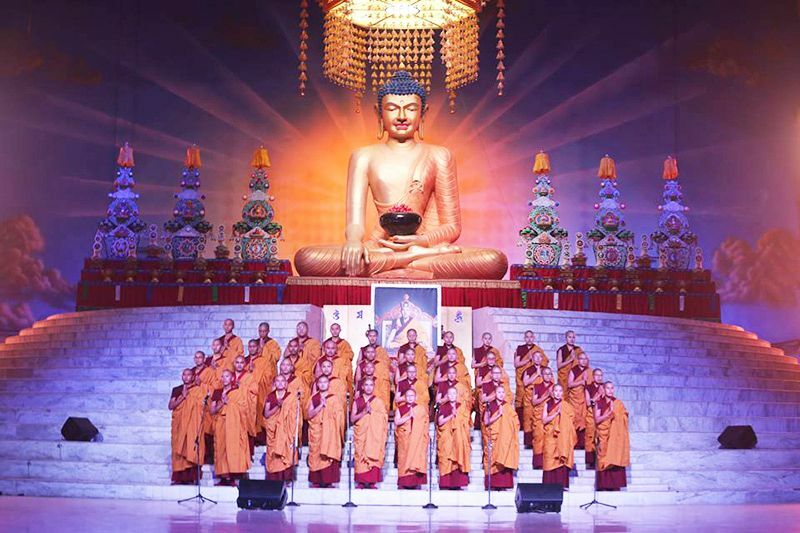 Two changes were immediately evident this year: His Holiness Karmapa has written several beautiful new melodies, and the chant masters, whose voices lead the assembly, now include nuns. It is moving to hear women’s voices mingling with the traditional deep tones of the men, and it is heartening to see the growing presence of the nuns among the sangha. 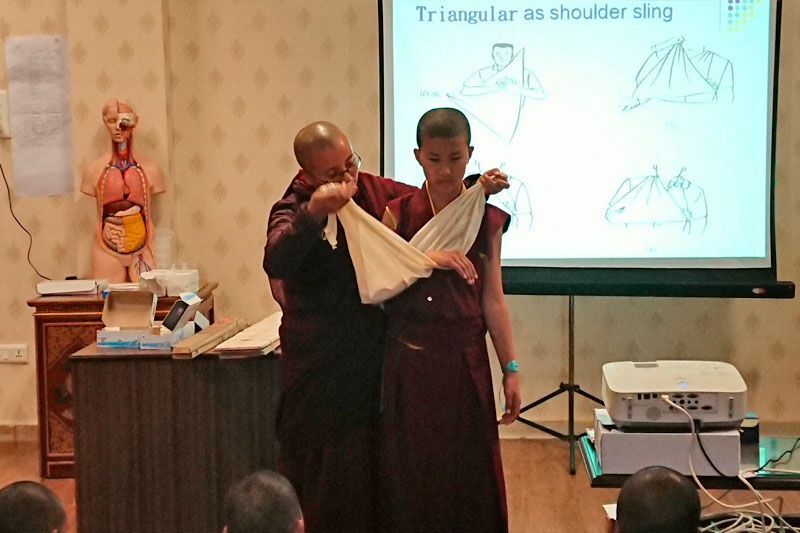 The first session of each day is the “Twenty Branch Monlam,” a series of ancient Mahayana rituals. After generating bodhicitta, the assembly prepares the ground, invites the Buddha into a beautiful palace garlanded with jewels, and offers a bath, a soft dry towel, perfume, and saffron robes, followed by the traditional Seven Branches: prostration, offering, confession, rejoicing, supplicating the buddhas to remain, supplicating them to teach, and dedicating merit. To these are added branches of aspiration and auspiciousness. It only takes a few times through the liturgy to gain familiarity with these rituals, and as with any practice, repetition deepens the impact and meaning. 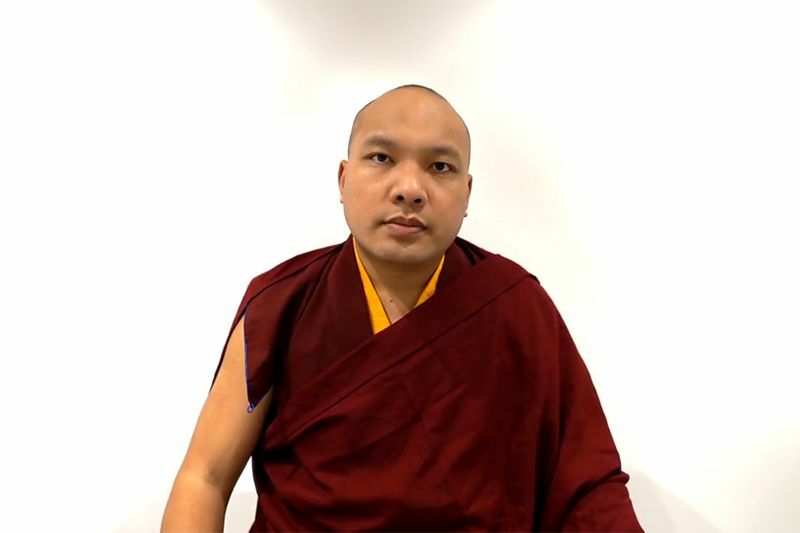 After a short break, His Holiness Karmapa joined the monlam via pre-recorded video to continue his teaching on Geshe Potowa’s Long Soliloquy, begun in previous years. Spontaneous applause broke out, and the crowd then settled in to listen to the dharma. It was an auspicious start to a week dedicated to the cultivation of virtue.